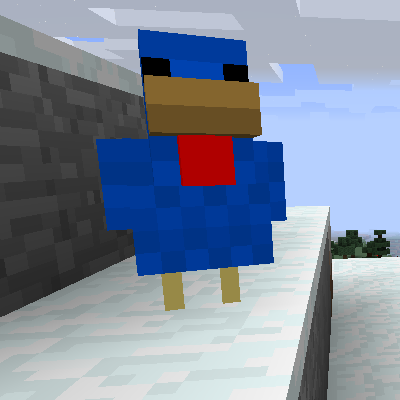 Everyone on my server loves this mod. Good work! You have a server with this mod installed? Could I please have the address? Thank you I appreciate that a lot ;). I just wanted to say that my kids and I have been having a blast playing with this mod. It's challenging finding all the chickens and breeding, but still fun enough to enjoy. (I agree with JasonAnaminus, the spawn rate could use a bump.) Thanks again! Could you please add support for biomes o plenty biomes? Or let the chickens spawn everywhere. I think the special chickens cannot spawn in the BoP biomes. Also Is there a way to bump up the spawn chances? That would be nice. How can you get log chickens and the like? I've tried every combo I can think of. Even went into creative to speed the process and nothing. What am I missing? EDIT: Found it. They spawn in world gen. This is just about the most overpowered suggestion you will ever get, but has there been any consideration towards a netherstar chicken? I'm only semi-serious. Another joke idea is a juke box chicken. Pops out disks. I'll semi-think about it :D. I would like to allow players on peaceful get access to every possible loot. Would you consider porting it to 1.9.4? Most mods are shifting there, along with Forge's development process, and I don't want to lose this mod in my modpack once I upgrade. Sorry to sound stupid, but how do you cross breed and mix chicken to achieve higher tiers? I am able to breed with seeds but I don't know how to access the breeding scheme shown in the pictures? You have to breed chickens with other chickens and even then it is not 100% you will get the new breed. I know that a flint chicken breed with a white chicken has a chance of producing an iron chicken. If you had the mod installed BEFORE log chickens, string chickens, and the other newest chickens were added, you will probably want to delete the config file. Also, JEI shows breeding info. First of all, GREAT MOD!! The sound of chickens is not so annoying now that I know I'm not going to end up with tons of eggs that have little to no use unless I add a food mod. Now that I'm starting to get tons of resources from my super chicken farm, is there a way you could make "condensed" versions of the resources? Put three bonemeal into a crafting grid and get a bone out or put nine bonemeal into a crafting grid and get a bonemeal stick or block, put 9 bonemeal sticks or blocks into a crafting grid and get a bonemeal bag or crate, etc. Similar to how Extra Utilities allows you to put sand, gravel, cobblestone, and dirt into more condensed forms? And do this with all the other chicken drops? Oh, and don't forget condensed "chicken meat"! Maybe make it's filled hunger bars and food saturation even better than a steak when cooked? Hi. I like the idea, I'll definitely think about it;]. Take a look at Everything Blocks. It does what you want and more! I don't mean to sound stupid, but what goes in the henhouse? Hi. Place the henhouse in the middle of your farm, put a few haybale blocks into the top left slot (they act as a fuel) and if chicken is within the range (4 blocks on each side) items will be collected in it. Henhouse produce dirt blocks as a side effect every time a haybale block is fully consumed. Is it clear? ;] Don't worry to ask me and let me know with your experience. Looking forward to an update to continue using this wonderful mod!